After creating my very first DIY wreath last April (hey, I’ll have to pay it a special tribute this year for prompting twelve months worth of creative wreath making! lol), I was determined to try out a different style of wreath each month. 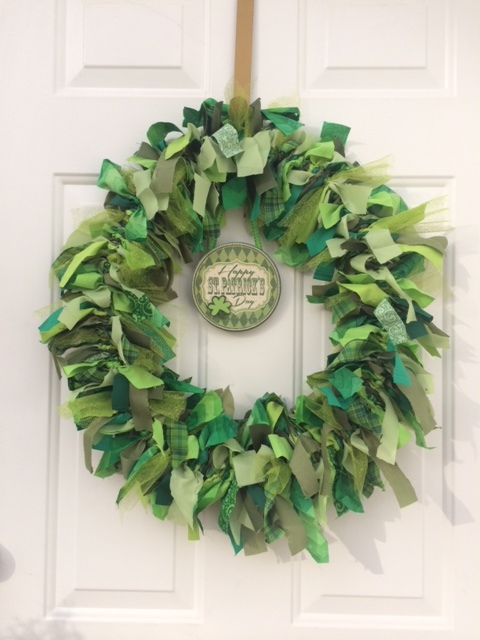 Since I gear each wreath toward either the season or whatever holiday happens to fall within that month, I wanted this wreath to be St. Patrick’s Day themed. 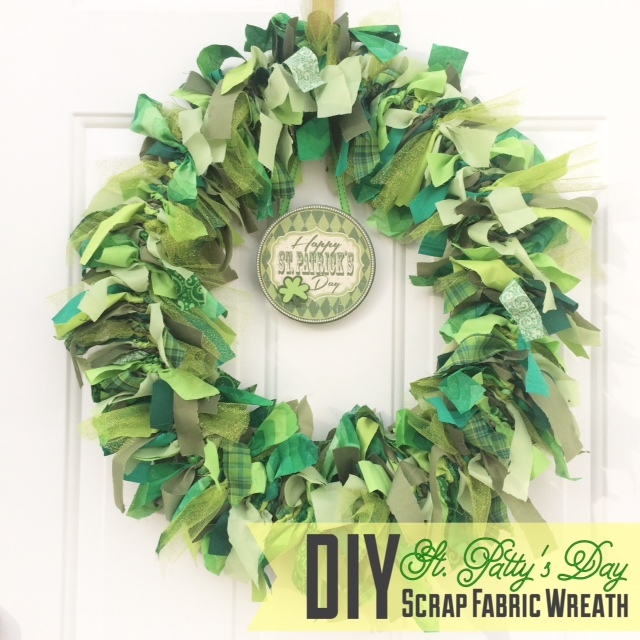 While browsing Pinterest for style inspiration I came across this adorable St. Patty’s Day Rag Wreath (pictured below) via The Magic of Ordinary Things blog. I immediately knew that this had to be my next wreath since scrap fabric banners are basically my favorite go-to party décor item of all time (check out my tutorial here). Additionally, I already had a ton of left over green fabric from the various DIY décor projects I had created for Baby P’s “Wild One” party so I was happy to put that to use and the rest of the fabric I found at my local fabric store on the sale rack and in the remnants bin. This wreath is now in my top three favorites (I’ll have to do a “wreath year in review” come April and rank them all, lol), mostly because it resembles my beloved scrap fabric banners but also because it is SUPER cost effective, coming in at just under $7.00!!! If you’re ready for a little more variety among your conventional DIY wreaths, this is super fun and different and can be customized to fit any holiday or color scheme, so dig into your scraps and give this one a try! wire – since lovely home *eye roll* is the only one in the neighborhood without a storm door my wreaths need a fighting chance of standing up to the elements so I used about 3 feet of thick plastic covered wire that I found at Lowes (near the rope) this way the wire couldn’t rust and turn the color of the fabric, it cost about $0.30/ft. (so less than $1 to create a makeshift 12″ wreath frame). If you have a storm door or sheltered front door you can do what was done in the previously mentioned tutorial above and form a wire hanger into a circle. fabric – the amount you need is entirely up to you and depends on how full you want your wreath to be and how many colors you would like to use. I used well over 100 strips, measuring about 1X6″ (as per the first tutorial). Begin by forming your wire into a circle and securing it with duct tape (shipping or packing tape will also do). Mine was about 12″ in diameter. 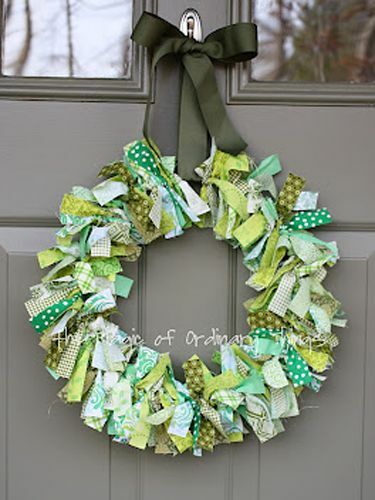 Next, tie your fabric scraps around the wreath until it is completely covered and none of the wire is showing. You don’t even need to knot it, just a simple single tie will do! At this point you can embellish the wreath in any additional manner that you please. I added a mini St. Patrick’s Day sign that I found at Hobby Lobby for 50% off. 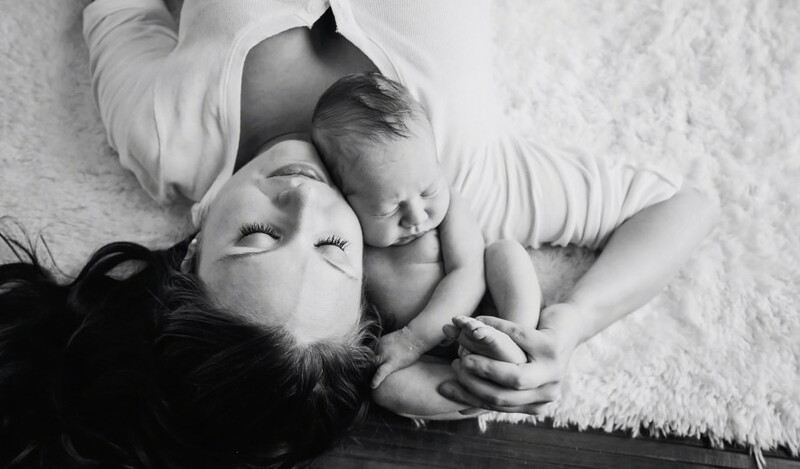 Click on this photo to check out my post on how I created my giant reversible “lucky” sign!